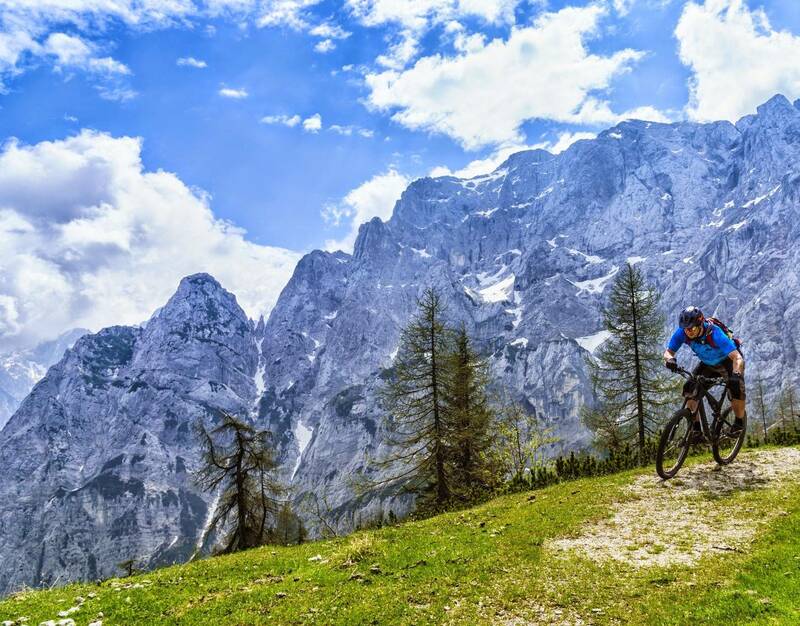 Trans Slovenia MTB Tour is a program that connects three countries: Slovenia, Italy and Austria and in just 7 days it offers almost everything – from snow, to wine and the sea. 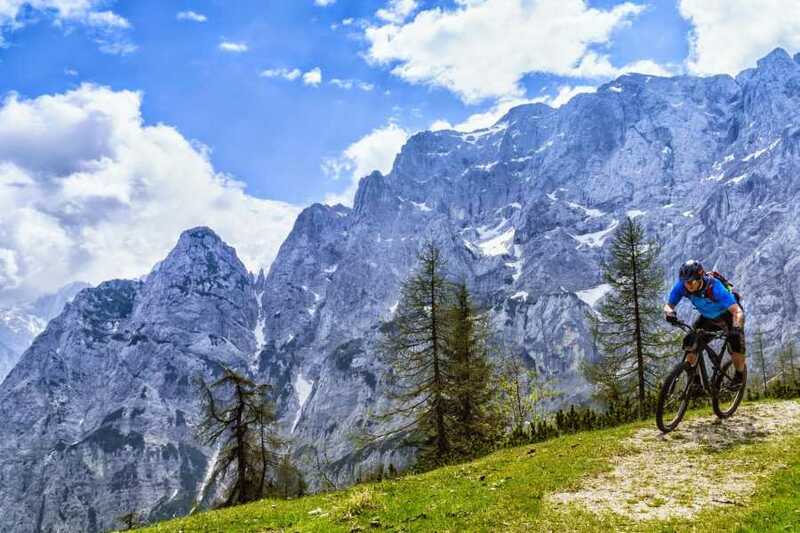 The trail starts with winding ascents to the Julian Alps in Kranjska Gora, across the Vrsic pass and a descent along the emerald wild Soča River (passing Bovec, Kobarid and Tolmin). Along the way we uncover the memories of the First World War, stop at the wine cellars in Brda and Collio, enjoy moments of extraordinary culinary delights, and discover the Karst region and its underground caves and intriguing Lipizzan horses. The tour ends with taking a dip in the warm Adriatic Sea while enjoying relaxing Mediterranean evenings. The tour starts in Kranjska Gora and ends in Piran on the Slovenian coast not far from Trieste port. The village is surrounded by 4 international airports ( Ljubljana, Venice ,Trieste, and Klagenfurt ). We can arrange airport shuttles from all 4 airports. Every evening there will be briefing session to attend where the guide will present next day tour profile (altitude profile, length, difficulty…). There will be many variations of each day tour. Arrive at the starting point at the beautiful ski resort of Kranjska Gora and enjoy some free time to explore Slovenia’s most famous ski resort. For those eager to go biking already on the first day, we can offer Tripoint (Mountain across 3 borders between Italy, Austria and Slovenia). Taken by a shuttle van to Arnoldstein, you’ll set off on a pleasant uphill ride to Tripoint and later a nice descent towards Kranjska Gora. From Kranjska Gora the road leads us through Krnica to the Vrsic mountain pass, one of the most beautiful ascents in this part of Europe. For the majority of our journey we’ll avoid the main road and cycle on gravel roads. From the top of the Vrsic pass we’ll take a descent to the source of the magnificent Soča River and continue along the river to a town called Bovec, known as a centre of outdoor sports. During the afternoon hours you’ll be able to explore this idyllic town or ride one of the zip-lines, offered by the local agencies. The road takes us from the majestic Boka waterfall to the village of Zaga where the ascent begins. We’ll cycle on a concrete road during the first part up to the Slovenia-Italy border and then ride over to a forest road leading to the top of Stol mountain. As soon as you get to the highest point, you’ll be struck by the incredible view of the whole upper-Soča valley as it opens up before us. The most beautiful element of the trip starts at this point as we drive along the ridge of Stol, which offers truly breath-taking views. Later we descend down a steep singletrail into the forest right to the banks of the Soca River in Trnovo village. Enjoyment guaranteed! Only a few kilometres of winding road along Soča will lead us to the small town of Kobarid, where tourism has been rapidly growing over the last few years. In the summer the Nadiža River, noticeably warmer than Soča, can be a refreshing treat with a soothing dip after such a challenging trip. This day’s stage takes riders to the next level. It’s regarded as one of the most difficult, due to the demanding ascent from Kobarid to Krn village and then onto a mountain pasture. All the effort undoubtedly pays off with a feel-good decent towards the valley of Tolminka River, past the Memorial Church of the Holy Spirit, a monument of the First World War. From there we’ll cycle above the Tolminka River to the small town of Tolmin. 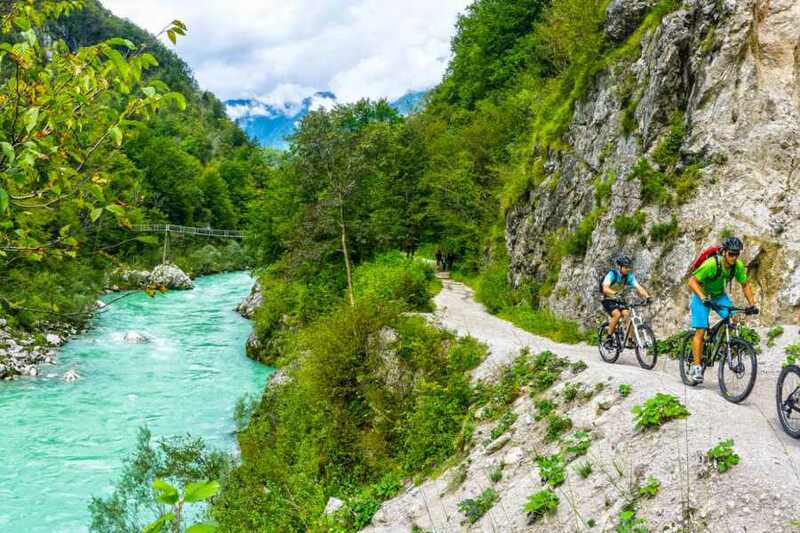 Those still with a little energy to spare might wish to cycle on to the Tolmin gorges. The stunning two-hour descent from the Matajur mountain is by far the highlight of the day. But first we’ll have to pedal hard to climb to the top (1642m). The reward waiting for us is the magnificent view and what follows is just pure fun – the downhill ride to Italy where we’ll stop and try some delicious Italian ice-cream. 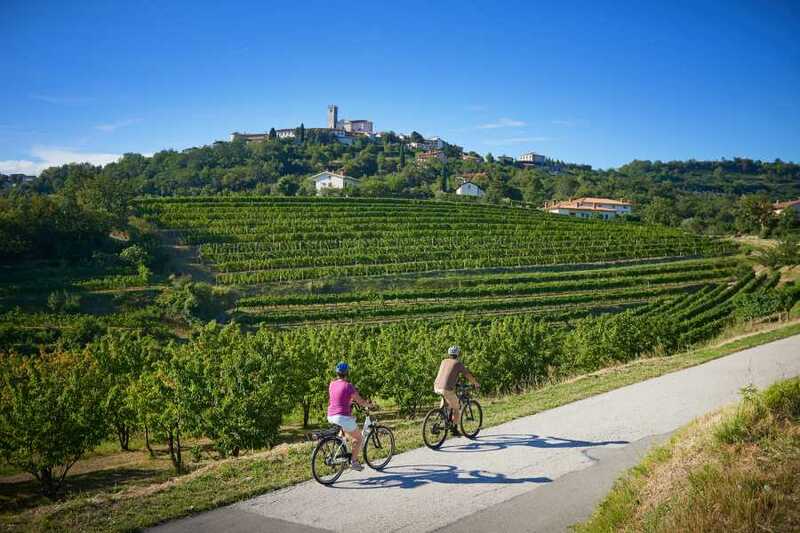 Moving on from these fun trails, it’s time for some easy pedaling through vineyards to the village of Smartno in Goriska Brda. 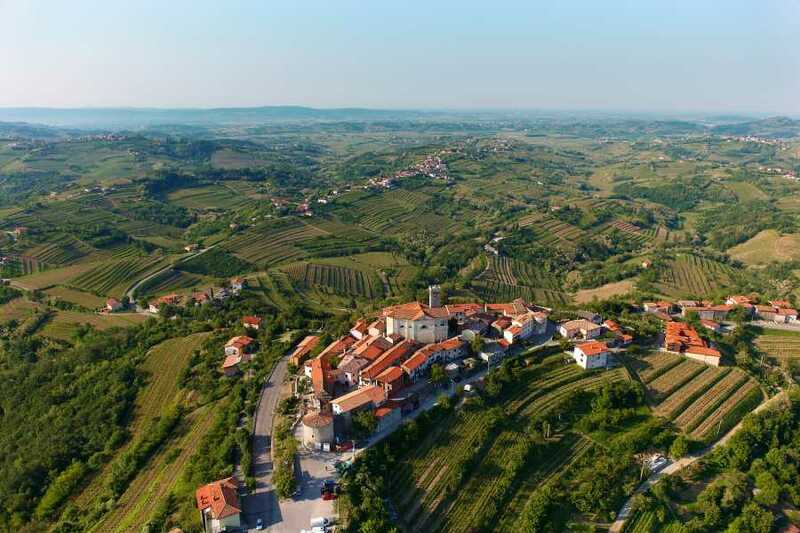 Many foreign visitors claim Goriska Brda is the Slovenia Tuscany so just like in Italy, there is a lot of excellent wine and food ready for us to taste. This is the longest trip within the program – in just a day we’ll almost cycle across the entire Slovenian Karst. During the day we’ll cross quite a few Karst hills and descend to Karst valleys along the single trails. The day positively ends in Lipica, where you’ll see the magnificent Lipizzaner horses. If you’re really up for a challenge, you might even try your hand at riding one! From the dry magical Karst, we pedal on to the heart of the Slovenian coast. 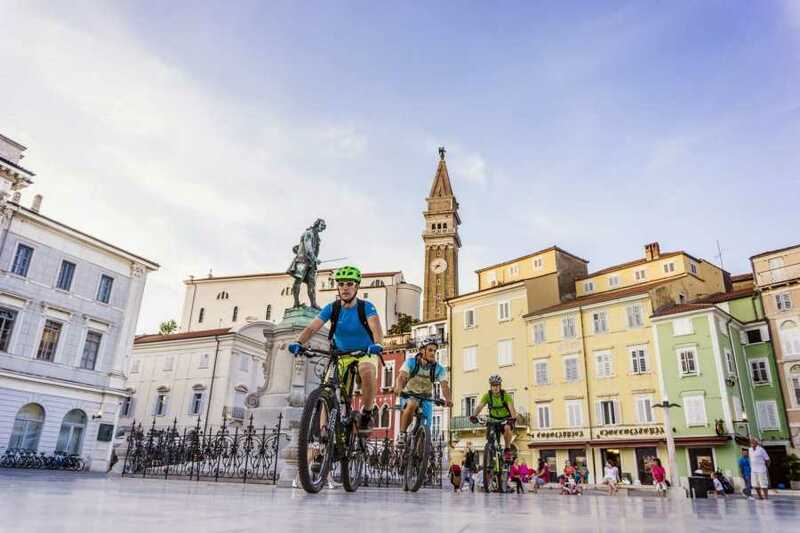 During the ride, we’ll climb Istrian hills, but the main focus of the final cycling day is directed towards the coastal fishing town of Piran. Here our journey comes to an end with a tasty seafood dinner, sweet Istrian wine and a dip in the sea. *Fully qualified and experienced mountain bike guide for the duration of your trip available at an extra charge.